We’re a few games into the second round of the NHL playoffs, and so far this postseason has been a mixed bag. We’ve seen several favorites move on, a handful of upsets, a sweep, and a pair of Game 7s. We’ve had the usual mix of great saves, heroic individual efforts, and controversial moments. And with two more rounds after this one, no doubt there’s far more to come. But with eight series down and four more under way, it’s hard to escape a certain sense of familiarity setting in. That’s because while every playoff series is unique in its own way, they all tend to follow a pattern. So whether you’re relatively new to all of this or you’re a veteran fan who could use a refresher, now would be a good time to run down the list of 25 moments you can expect to encounter in any given NHL playoff series. If you’re lucky, you get up to a week’s notice. More often, you only get a couple of days. But either way, it’s more than enough time to start building up some animosity balanced with a healthy dose of fear. These guys aren’t bad, but your team should be able to beat them as long as everything goes according to plan. It should be an enjoyable series. And hey, may the best team win. Now is a good time to seek out some of the other team’s local media and get to know their work. After all, they know the opponent best, and you’ll probably gain some valuable inside information by keeping up with their work. Follow a few of them on Twitter, just to make sure you’re always getting both sides of the story over the weeks to come. Make sure you get the lead columnist from all the major dailies, plus a radio guy or two. Maybe even throw in the play-by-play guy – you’ve heard he’s quite the card. Always good to hear some voices from across the aisle, right? This is the big one. Game 1 sets the tone. It’s the one that determines who gets the momentum. 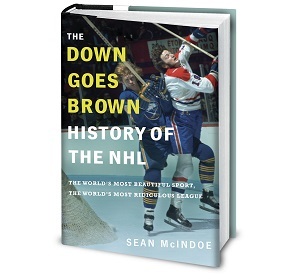 Over the course of NHL history, the team that wins Game 1 has gone on to win the series 112 percent of the time. I may not have that number exactly right, but it’s something close. Game 1 is everything. You’re rooting against the guy – that goes without saying – but you have to admit to a certain grudging respect. He’s a hell of a player. Sure, he has delivered the occasional cheap shot and he probably dives a little bit too much for your liking, but you’d take him on your team in a second. It’s shameful and laughably over the top. It also works every single time without fail, with the exception of whenever your team’s coach does it. Do the other team’s fans know about this? It’s always some third- or fourth-liner that you’d never heard of before, and he doesn’t really do all that much in the series. But he’s on camera just often enough that you start to wonder: What’s wrong with this face? Does he realize his jaw does that? Where is he from, and does everyone who’s from there look like that? Every time this guy shows up onscreen for the rest of the series, the next five minutes of the game will be ruined. This is always a fun one, since it happens organically. There’s no meeting; nobody holds a vote; nobody sends a memo. But at some point, everyone unanimously decides to boo one (and only one) player on the other team every time he touches the puck. It could be the superstar, the pest, or just some random guy, but it will happen to somebody. This offseason, he’s going to use this playoff run to demand a massive contract. This time next year, you will hate him for ruining your team’s cap. But today, you are willing to name your firstborn after him.